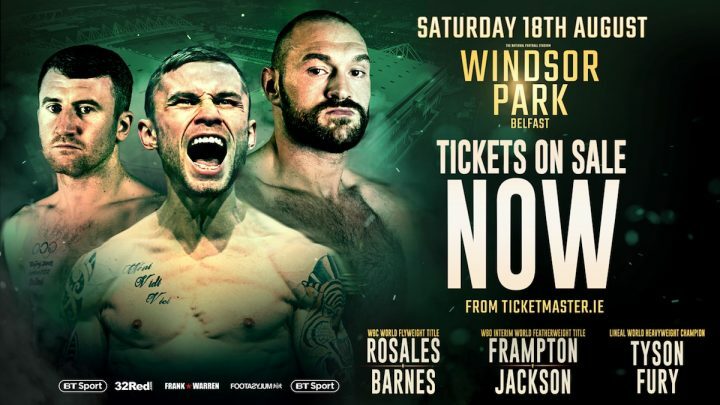 TICKETS are now on sale for boxing’s summer sizzler at Belfast’s Windsor Park on Saturday 18th August starring Carl Frampton, Tyson Fury and Paddy Barnes. Frampton will defend his ‘interim’ WBO world featherweight title against Australian Luke Jackson, who is ranked ﬁfth in the world. It is a huge occasion for Frampton and he hopes victory will set-up a showdown with IBF champion Josh Warrington. Lineal World Heavyweight Champion Fury will box a non-title ten rounder in his second comeback ﬁght and is on a mission to conquer the world. Frampton’s close friend Barnes will challenge for the WBC World Flyweight title in just his sixth professional contest when he faces champion Cristofer Rosales, who will making his ﬁrst defence. A talent stacked undercard will be announced by promoter Frank Warren in the coming weeks featuring some of the big names and emerging stars in world boxing. Don’t miss out on your chance to get your hands on the hottest tickets in boxing before they sell out. Tickets are available from www.ticketmaster.ie. priced at £40, £50, £80, £100, £120, £150, £250, £400 (includes hospitality). Carl Frampton accepts Luke Jackson poses a serious threat to his world title aspirations but has told the Australian Belfast will serve up an atmosphere more daunting than any other. Australia’s Jackson (16-0-KO7) will enter the cauldron of Windsor Park on August 18 as the underdog – but Frampton doesn’t have to look far back into his own history to find a cautionary tale. Frampton said: “The last time people were saying a fighter didn’t pose a threat to me was against Alejandro Gonzalez Jr and I ended up on my backside twice in the first round. It was the first time I’d been down in my career. “Luke Jackson is an undefeated fighter and former Olympian with a very decent pedigree. He comes with a lot to gain if he beats me. He’s highly ranked with the WBO and I expect a tough fight. “Jackson has had plenty of notice to get himself into the best shape of his life and he’s entitled to put on a great performance. It’s up to me to better his performance and that’s what I’m going to do – Windsor Park deserves it. I want to do a proper job. “The thing is – like most other featherweights, Jackson won’t have experienced an atmosphere like Belfast can create. I’m used to boxing at the SSE Arena in Belfast and it’s intense. It’s got to be hard for an opponent to deal with. “It’s hard enough in front of 9,000 at the SSE Arena so just think how tough it’s going to be to fight against a hometown boy at Windsor Park. It’s going to be so tough. It might make him fold or it might gee him up but one thing’s for sure – it won’t be easy for him. Frampton is aiming to become a three-time world champion having already secured two-weight status with memorable victories over the likes of Leo Santa Cruz and Scott Quigg. Another local hero – triple Olympian Paddy Barnes – also stars on the card as he challenges Cristofer Rosales for the WBC world flyweight title. Lineal heavyweight king Tyson Fury completes a glitzy cast.